For many years, in armwrestling there were only two formats of fights. There was a single duel, which instantly determined who is stronger, and also there was a tournament format, with more than 2 athletes participating. 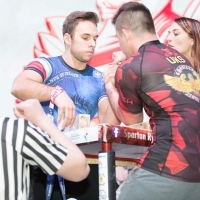 In 2001, Igor Mazurenko, then - sports enthusiast, and today - a well-known promoter and, according to many, the founder of the contemporary professional armwrestling, proposed a new format of the armwrestling bout. Igor offered a 6-round series of duels with a break of 1-2 minutes, which in addition to strength, required from the athlete some unprecedented level of endurance. And that new format was called "Armfight". The first armfights took place in Poland in 2001. Today, looking back at what happened then, we understand that it was a real revolution in armwrestling. The new format changed the picture of the world’s arm-sport. For years there was a certain pool of world’s "stars", the unbeatable pullers, which has not been changing over the years. With the advent of armfights the situation has changed dramatically. The factor of endurance came up and many "gods" had to leave their Olympus. Namely the endurance was the “secret" and "terra incognita" of armwrestling. The armwrestling matches during which the small guy pinned the huge opponent always impressed the public. And the key to this was the endurance. According to many armwrestling veterans, the armfight format opened a second wind for the sport, added spectacularity and equalized the chances for all the athletes. Today the armwrestlers are divided into those who take part in regular tournaments and those who fight exclusively in armfights. Devon Larratt is one of those talents who became world famous and found their way to the heights of professional sports thanks to the multi-round format. Using the strategy of getting his opponent exhausted in the first round, Devon, who has extraordinary endurance, does not leave the opponent a chance to win the remaining five. In November 2018 at the Vendetta All Stars armfight series in Poland, Devon will be able to prove his dominance in the long-awaited duel with one of the strongest armrestlers of the planet - Denis Tsyplenkov from Russia. This match will be broadcast live on the main armwrestling online TV platform armbets.tv and will be followed by the whole world. Armfight revolution goes on.